- The key finder can use the smartphone to connect four keys. - You can immediately find the object to find. - Bluetooth 4.0 technology so you never lose track of valuables. - Time Is Very Valuable, Don't Waste Anymore Of It Endlessly Searching For Misplaced Items! 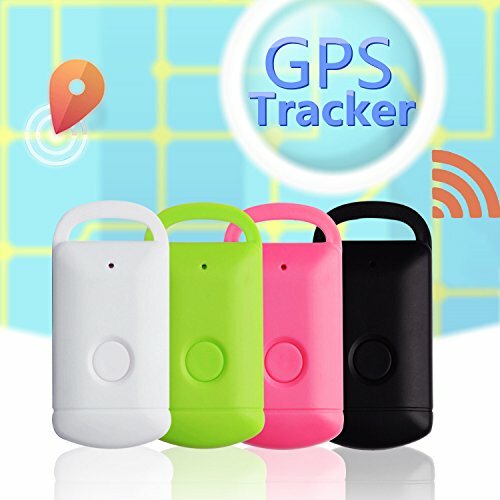 - You may always forget your key, luggage, purses, wallet, pets,bag before, with our smart finder mini bluetooth anti-lost tracker! - Leave you away from unnecessary troubles like losing keys, pets, phones, backpacks, cameras, kids toys, wallets, bags, luggage, kids and so on. - Simply take the item from the box and download the free app we provide details for onto your android or iOS Apple system and you can sync in seconds. - You can then have multiple devices linked and a range of settings for distance alerts which are easy to programme and use. - Battery - CR2032 lithium coin battery(included). - Our fan-favorite hassle-free 12-month warranty and friendly customer service. PORTABLE REAL GPS TRACKER: Find things near and far. Save time at the touch of a button. Say no to spending time searching for things hidden in the obvious places. Easy to use, compact and lightweight, handy like a key ring, and you can pair up to 4 trackers simultaneously to a phone, keep your valuable things safe and within your range. Compact size goes anywhere, attaches to vehicle or belt, insert in backpack. Perfect for tracking vehicles, teens, spouses, elderly persons or assets. ANTI-LOST & ANTI-THEFT: Both the Tag and your phone will beep to alert you when they disconnect from each other. Keep your loved ones within reach, watch over your valuables and monitor your workers, fleet and assets. You can even locate Your Phone by pressing the button on the gadget it will send the phone a ringing noise until you locate your phone. Find peace of mind with real-time location tracking and movement history, right from your iPhone, Android device or PC. Download APP: "iSearching" compatible with iOS and Android. This tracker should be used with iSearching, an app downloaded from App Store/Google Play and pair it to your phone via Bluetooth. Remote control function, can remote camera and selfie trigger, it can also provide a last seen pin-drop on map via APP to help you recover your items and search your cars in parking site. LONG BATTERY LIFE SUPPORTED: Benefiting from the built-in low consumption Bluetooth 4.0, the battery can last for about 12 Month. Uses one CR2032 coin battery (included). Easy-to-replace battery, each battery can work up to one year. Even if you do not hear the reminder and do not have to worry, APP will record the location information of you and the object and display it on the APP bult-in map, which can be found on the map. What You Get: 4* MarMoon Smart Bluetooth GPS Tracker, 4* User Manual; our fan-favorite hassle-free 12-month warranty and friendly customer service.